Yeah, one of the rare games I did buy. I didn't play it for years, does it hold up? Not really the same as Oni but looks interesting in the girl-with-guns genre. Hmm, what was her name again? I think I will call her Slowmo McJumpsalot. As you said, it's not exactly an Oni 2. I think I heard someone say "unlimited ammo". Definitely aiming away from the direction of "realistic", but as long as the controls are good I bet a lot of people will enjoy it. 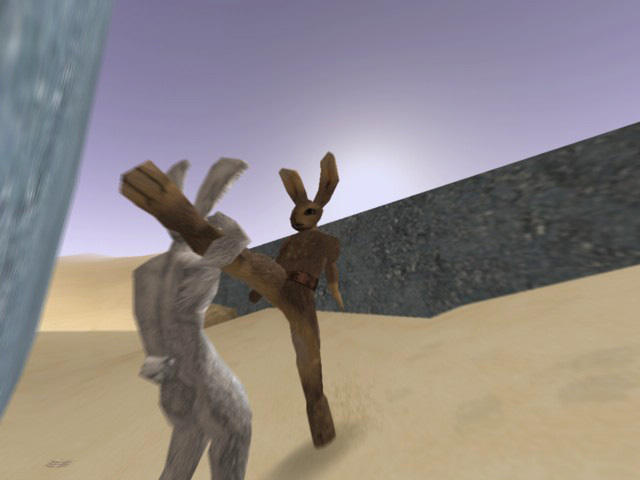 Rabbit Ninja Combat, with hand-to-hand and weapons like a staff, knife, or sword, and lots more blood effects, but nice pastoral scenery. Basic key/mouse controls are somewhat similar to Oni. The thing I don't like about Lugaru is that there is really only one attack button, and what it does is different depending on a whole bunch of different things. So I never know what attack I'm going to use. not on par with oni, but oni2 or future theoretic games similar to oni could draw many good ideas from lugaru series. mount and blades has a pretty good fighting system as well...plus multiplayer fighting add on is coming out. the fight mechanics seemed rough on the edge at first, but the feeling of fighting was quite sensational. these days, developers only want to do beautiful animations instead of designing a system where players could really duke it out... like assassin's creed series... kind sad. This mode actually completes the melee part, but hell it gets annoying after while. - A very good melee fighting system - variety of strikes, kicks, combos, great fatalities, etc. The only slight drawback compared to Oni is that it is a bit easier. 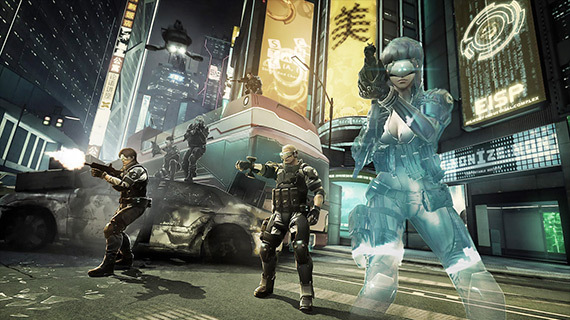 Enemies are much more in numbers, however, it is easier to dispose of them except for the strong ones later in the game. I'd love to see a game like Oni or a true successor to Bloodrayne 2 (BloodRayne: The Third Reich does not count). I've seen this game in the past but somehow it did not appealed to me. Plus I do not have a console so I play on Windows only. Terminal Reality pretty much stopped PC development after BR2. And now I see they are out of he business so we may never see another BR. Too bad. Yeah, it's a shame, I was hoping to see another melee-oriented game running on that engine of theirs. I see that this topic is rather old but I just can't help but notice the lack of Beyond Good & Evil (you can check it out on Wikipedia). I can't say it's exactly "like" Oni, it is much more stealth oriented but still, I believe that someone who likes Oni will like BG&E. Yes, I think I didn't mention BG&E in my original reply because it's not action-oriented, but it's a good game regardless. And welcome, by the way! Incidentally, I finished playing Aeon Flux for the PS2, and gradually came to be amazed at just how intricate the melee is, and how it incorporates parkour. I'm not aware of any games that can rival the depth of the combat, in fact. Unfortunately, like Oni, there is no training area which you can visit at will to practice all your moves. They give you a very cursory training during the first level and that's it, and there's not even diary pages explaining how to do the moves. So you occasionally pull off amazing moves by accident, but most of the time you stick to the same handful of safe moves that you're comfortable doing. And I think it would have benefited from PC controls, if it had been ported to the PC. Has anyone mentioned The Witcher? It's an action-rpg. The RPG elements allow you to develop your character in different ways and the combat system is combo oriented. There are no guns but you can use a number of magical signs and alchemical bombs and traps. The plot is also great. The Witcher 2 is less great... it's more of a slasher and has a bit of an issue with balance on higher difficulty. Currently I'm playing Death by Degrees, and it has very complex melee/gunplay/swordplay controls. However, since it's an old PS2 game, it's not exactly accessible for the average gamer who wants to play something like Oni. I decided to start a new topic for it like I did for the last Oni-like game I played, Aeon Flux, but I'm mentioning it here since this has become the "master list" for Oni-like games. In fact, you know what? Why don't I sticky this topic so it's always at the top of the subforum. It's probably our most valuable "Anything but Oni" thread. There were so many posts, Tl:dr, so I'm just add this since it's somewhat rare for people to like this game right off the bat anyway. It features intense combat and a campaign like Oni's. Of course, Oni was very story driven whereas this game allows the player themselves to explore the world at their leisure, never mind the hordes of enemies you'll eventually learn to overcome, all the while taking grasp of a unique you in this world of weapons, invulnerable rolls, back stabs and ripostes. I am a big fan, no doubt, but that doesn't cloud my judgement when I say this game will possibly fill a tiny bit of that hole of not having Oni 2 to play. Overall. It does not feature the exact same style of fighting Oni did, nor does it give you guns, but rather sets you in a medieval universe, lacking any real technology such as guns, leaving you with a plethora of bladed weapons with which you can combat and take to Online PVP. Though, the guns have been placed in this game purely as an instrument of hindering opponents and at times with careful timing, allowing you to ripost-visceral attack them for tremendous damage. 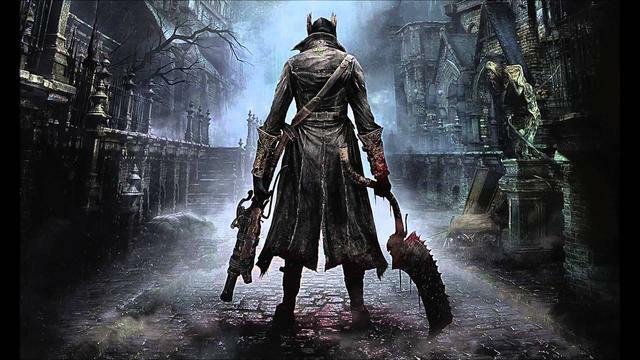 I have not played BloodBorne for it is a Playstation 4 exclusive. But it is a fun game if my friends opinions are to be counted on. A faster pace on the PVP will leave you with the feeling of the hunt progressively building in your veins as you plummet deeper into slaying the beasts in it. Tell me what you guys think, appropriate? No? Just came across this, if you like the theme and style of Oni you may want to check out the new online Ghost in the Shell video game. I am looking forward to it myself! You have to pay to get access for now, but will be free to play later. Hey VR, how are things? I've had my eye on this game for a while, though surprisingly it seems that it's never been talked about on the forum before. Of course, it's a shooter, so no gameplay similarities, but anything in the Ghost in the Shell universe is worth mentioning. I'm not into weeb stuff so I don't know the GotS universe, however, I did play First Assault. It's a mediocre shooter at best. It's like every other free-to-play lobby-based Korean grind shooter out there, except it's within the GotS universe. I didn't play it much. It wasn't interesting at all. Doing well thanks, glad to see this forum still alive and kicking. Looking forward to more awesome AE updates! Need to get on that Oni 2 development soon . All that I'm working on these days is MP (and slowly, because of my work schedule), but feel free to drop me a line or sign into YIM if you want to touch base on any other projects.